Joost Custers met Markus Palttala to discuss the Finn’s 2005 season – and prospects for 2006. 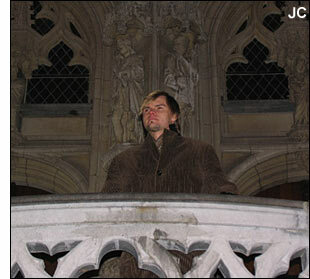 The first image shows Markus in front of the Gothic Town Hall at Leuven, in Belgium - the second one of Markus is in a local bar. 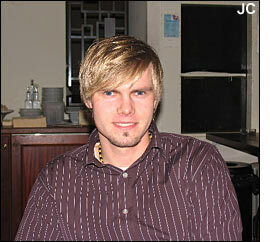 Markus, how can you sum up your experiences on the track in 2005? Well, it’s difficult to say. I did the full Belcar and LMES series, together with the Spa 24 hours, the Spa 12 hours in BTCS etc, so I had certainly enough racing kilometres. I shared my cars with gentlemen drivers, which was a must for me to get the drives and I’m thankful for the chances I had from both Lefort / Lambert (Porsche 996 GT3-RSR in LMES) and Leo Van Sande (Porsche 996 GT2 Biturbo in Belcar). My individual results, if ever an endurance racer can use this term, were good. I showed in LMES what I’m capable of. Certainly the races in both England and Germany were highlights. I managed to take the Gordon Porsche from the middle of the GT2 grid to the front and was among the fastest Porsche drivers. But as I said, while sharing the car with good gentlemen drivers, it remains impossible to beat full professionals such as Marc Lieb or Xavier Pompidou. But I’m still glad I had the opportunity. Finally we finished third overall in the rankings, still a great result for the first season at an international level. In Belcar it was the same story. I led some races and took a pole but there was some bad luck too: without mechanical problems we could have won the Zolder 24 hours. Altogether, I’m happy with the past racing season, but results sometimes were a bit disappointing. Well I’m still an employee of PSI and so my future lies within the team. I’ve been looking around in wintertime, to explore whether there were any opportunities to go racing in DTM, ALMS or Grand-Am, but at this point I think I will continue with PSI. We’re very close to a deal for 2006 combining a very attractive program with a commercial responsibility within the team and this prospect, honestly, pleases me very much. So what are the plans for PSI? I could easily answer that nothing is confirmed yet, but I won’t. PSI will be active in different championships on different levels. Let’s start on top. As we managed to acquire a Corvette C5-R, the ex-Pacific car, and a C6-R, PSI will be present again in international championships. This is important for PSI and it is one of the goals of our new co-owner, Phillipe Tillie. He wants to bring PSI back to an international level of racing. 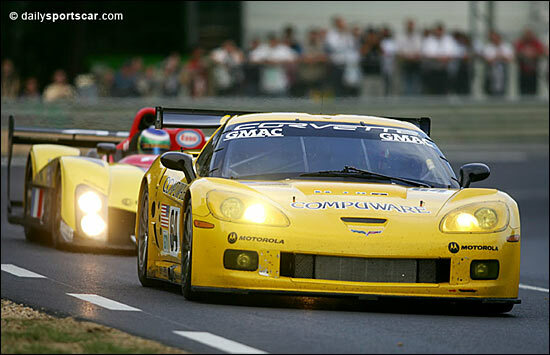 The choice between FIA-GT and Le Mans Series isn’t really made yet, but we will do the latter with at least one Corvette. The driver pairing is not 100% sure but we’re close to a deal with drivers who raced for PSI in 2005. In FIA GT everything remains possible, but as we will also do the FFSA GT and Belcar, it’s maybe a better solution to focus on one international championship. 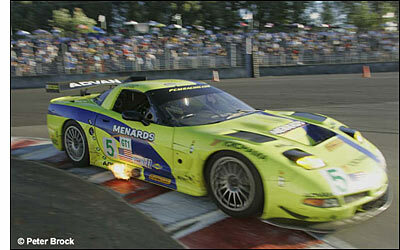 We also hope to be on the Le Mans 24 hours starting grid, but an entry at Le Mans is not definite. Last but not least, PSI will compete in the Spa 24 hours with both cars. At a national level, there is a good chance to see different cars in the FFSA-GT. The Corvette is a possibility but the Porsche GT2 is another and maybe a combination of both. In Belcar, the situation depends on the confirmation of the rulebook and the calendar. Normally we will continue with our pair of Porsche GT2s: Bouvy and Menten will drive together with me and somebody else. The decision of who drives with whom is still open. 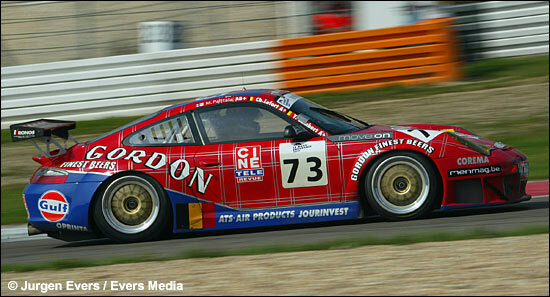 There will also be two more GT2 Biturbos in Belcar. One is the car I drove last year. The Thiers brothers will drive it with some technical assistance from us. The second car is another story. JMT bought the car from Noury Compétion in France. It’s one of the older cars and we have nothing to do with it anymore. And what will be your role with the team? Myself, I will combine probably an international and national program within the PSI team, the series won’t differ much from last year. Once I can provide the details, dailysportscar will certainly be informed. Thanks Markus and good luck.